Wing of female of Hippobosca longipennis from Maa and Peterson (1981, fig. 17) . (1981) Hippoboscidae. in: McAlpine J.F. (Ed. ), Manual of Nearctic Diptera. Agriculture Canada, Ottawa, pp. 1271-1281. Wing of female of Stilbometopa impressa from Maa and Peterson (1981, fig. 16) . Wing of male of Myophthiria fimbriata from Maa and Peterson (1981, fig. 15) . 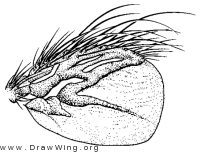 Wing of female of Ornithomya anchineuria from Maa and Peterson (1981, fig. 14) . Wing of female of Pseudolynchia canariensis from Maa and Peterson (1981, fig. 13) . Wing of female of Icosta americana from Maa and Peterson (1981, fig. 12) . Wing of female of Ornithoica vicina from Maa and Peterson (1981, fig. 11) . Wing of female of Neolipoptena ferrisi from Maa and Peterson (1981, fig. 10) . Wing of dear ked (Lipoptena sp. ).